Wedding PR: Offbeat Bride, Huffington Post, and more! Another week, another fabulous client press round up including Offbeat Bride, Huffington Post, The Knot, and so much more! Keep scrolling to check it all out! 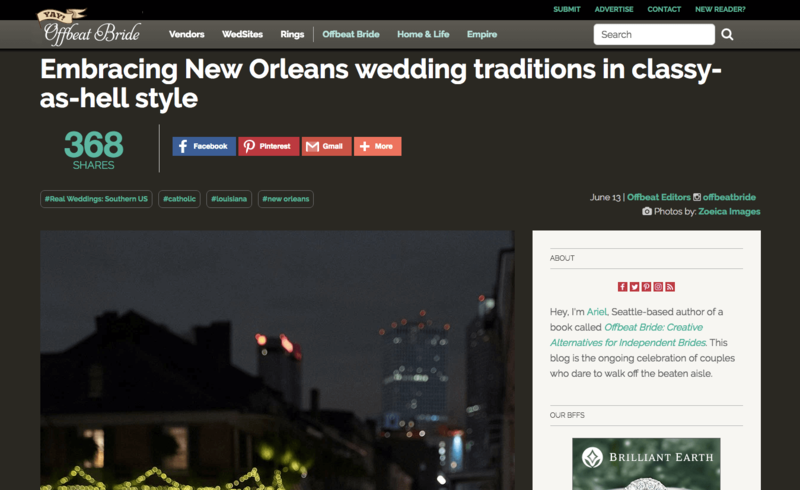 Get Polished was featured on Offbeat Bride with a New Orleans Wedding. See the full feature here. Make It Posh Events was featured on The Knot as expert commentary in the article Are You at Risk of Wedding Vendor Fraud? See the full article here. Taylor’d Events was featured on Special Events with the guest article Something Borrowed, Something Blue: Wedding Traditions You Should Know. See the full feature here. Gay Destination Weddings was featured on Gay Weddings with their guest article about what the essential elopement do’s and don’ts are. See the full article here. Azazie was featured on the Huffington Post article Wedding Party Fashion Challenges (and How to Tackle Them). Check out the full feature here. XOXO Weddings and Events was featured on The Knot in the article Budget Tips for Broke Bridesmaids and Groomsmen. See the full article here. Kaysha Weiner Photographer and Stephanie Yonce Photography were featured on the Huffington Post’s article 5 Ways DIY Projects Will Make Your Wedding Worthwhile. See the full feature here. Azazie and Destination Weddings were featured on Brides.com in the article How to Choose Your Maid of Honor Without Hurting Anybody’s Feelings. See the full feature here. Cescaphe Event Group was featured on Aisle Perfect with the Philadelphia wedding of Christine and Dustin. See the full feature here. 100 Candles was featured in the Huffington Post article From Start to Finish: Incorporating Candles On Your Wedding Day. See the full article here.